Why Are African Wild Dogs Endangered? 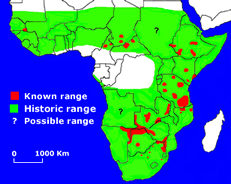 Wild dogs were once widely distributed throughout sub-Saharan Africa. Today, viable populations may exist in only a handful of countries. Habitat loss and human persecution are the main causes of decline. Wild dogs fall victim to snaring, shooting, and speeding vehicles on roadways. 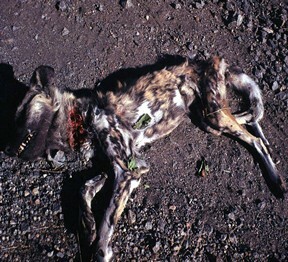 This graphic picture is of a yearling female that died in a snare set by a poacher for antelope. Disease such as rabies and distemper may also threaten some wild dog populations. The increasing needs of a growing human population place greater demands on natural resources, inevitably shrinking the living space for wildlife. The African Wild Dog Conservancy is committed to community-based research and education to help conserve this unique canid. African wild dogs are not domestic dogs gone wild, nor are they closely related to wolves. Learn more about their genetic relationship to other canids.